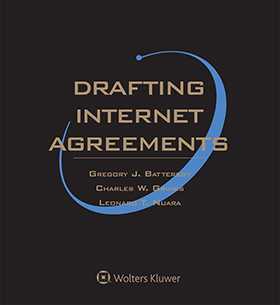 Drafting Internet Agreements, Second Edition is the most comprehensive single volume collection of annotated forms for the internet. The book also offers valuable insights for business executives who want to know how internet transactions are structured and how to negotiate the best deals. Each form has been developed by the authors or other experienced internet law practitioners and has been used in actual transactions. Organized by type of transaction, each chapter includes a full agreement that illustrates the entire transaction as a seamless whole, as well as a variety of agreements for closely related issues. For each form, the authors provide a brief overview, an analysis of the different kinds of forms that relate to the topic, and a description of the form's applicability and use. A "Practice Tips" section before each form identifies the "hot spots" that are likely to arise during the transaction, and offers guidance on resolving these hotly negotiated provisions quickly. Detailed checklists assist in drafting the final agreement. Drafting Internet Agreements, Second Edition also includes a free companion CD-ROM containing over 40 forms presented in the guide, making it easy to incorporate the forms into a word processing program.